The ENOUGH Campaign memorial vigil makes front page news. As this year comes to a close, we take a look back on all that The ENOUGH Campaign has accomplished over the course of 12 months. Growing from a group of fourteen concerned moms in Connecticut who wanted to make a change for the better through gun violence prevention in the wake of the Newtown massacre, we have now become almost 2000 members, friends and followers strong. We are the voice of the "Connecticut Effect" and beyond. Gun violence became the hottest topic of 2013, both sides of the conversation rose to the surface, and we continue to fight vehemently for our causes. One year ago, the tragedy at Sandy Hook Elementary began a long-overdue nationwide debate about gun violence prevention. The conversation that followed led to at least three new national groups advocating for reform, 23 executive actions signed by President Obama, and stronger state gun laws protecting roughly half of Americans. To the disappointment of anti-gun violence advocates, however, Congress failed to pass a single reform addressing the 6 million gun purchases that slip through a weak background check system. [i] The fight continues, and we refuse to back down. 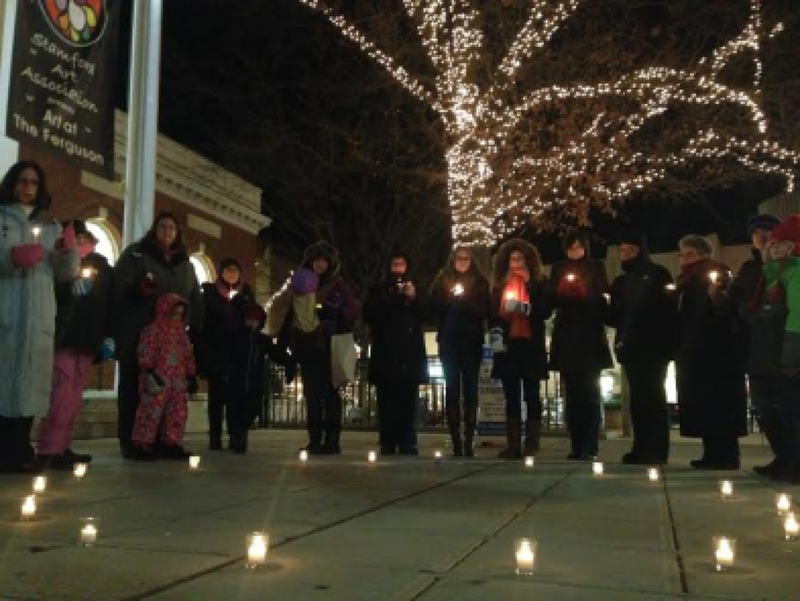 The ENOUGH Campaign experienced a media blitz from our Vigil of Hope on December 12, 2013, marking the one-year anniversary of those killed in the Newtown massacre and honoring those lost to gun violence across the country. Multiple news outlets were there to cover the event, and our story was even picked up nationally. In addition to a powerful segment on the Rachel Maddow show with Jr. Newtown Action Alliance teen leader Sarah Clements, you'll find below two important letters for you to sign. We also list some great organizations and memorial funds to which we recommend you give your end-of-year contributions. And of course, as always, we have a number of new links to inspire you to help move our cause forward. This past year, America has awakened from its gun violence prevention slumber. It is now time to fight for stronger laws, to influence corporations and businesses, and to raise awareness and funds for gun violence prevention. #NowIsTheTime. If not now, then when? It was a freezing cold night. I couldn't feel the tips of my fingers minutes after I arrived. I strapped the baby to my chest and brought my almost-5-year old with me because I didn't have a baby sitter. But I had to go and pay my respects. One of the organizers set up a beautiful circle of candles which gave a meditative quality to the vigil that I can't quite describe. There must have been at least 30 people there in front of the library, holding candles, talking, and some even hugging. Some in attendance had been directly affected by gun violence, having lost loved ones. Others were there to convene with like-minded folks who wanted to reflect on the loss of too many people killed by gun violence every year. Standing there holding my candle, sometimes I felt sad, but looking around and seeing others wanting to reflect, honor, and act, I felt oddly at peace. There was a true air of hope. There were some journalists there, a camera crew, and several photographers. They were talking to the organizers and others in attendance. The Vigil of Hope ended up getting some major coverage, from News12 Connecticut, to the front page of the Stamford Advocate, to ItsRelevant.com, and Stamford Patch. The vigil even grabbed the top headline on a national news website, all which is great for the cause. Some passers-by came up to us and asked what the vigil was for. One man asked, "Did somebody die?" and a number of us answered, "Yes," going on to explain why we were there. Spreading the word about gun violence prevention was an additional reason for this vigil, other than the vigil itself. It felt good to talk to others about what had happened and why we were there. But a vigil isn't something I'd really want to have to attend again. I don't want to have to go to a vigil like this one, anyway, having been created in honor of people who have died due to gun violence. But considering our country has an epidemic of gun violence deaths - 30,000 annually - it looks like I may be attending another vigil in the future. But I don't want to. Please help me and The ENOUGH Campaign to stamp out gun violence for good. No one wants to have to light a candle for a six-year old who was ripped from her family after having been shredded by bullets in her first-grade classroom. Or for a loving father who was shot and killed by a disgruntled client. Or for a young man who was walking home from the corner store. We would much rather have their lights shine brightly here on earth rather than in a jar of glass and wax. These gun deaths CAN be prevented. So tonight, on the winter solstice, I light a candle for hope. And then? I will ACT. Cerberus: Stop profiting from murder and divest from the maker of the Sandy Hook massacre gun. Uphold the promise you made one year ago and sell Freedom Group. "My name is Neil Heslin. My son, Jesse, was in first grade -- just six years old -- when he was killed December 14, 2012 at Sandy Hook Elementary School." Neil Heslin is asking us all to demand that Cerberus Capital Management, which owns 94% of the company that manufactures the gun that was used to kill his son, to follow through with their promise to divest. The organization has written an open letter to the above stores, thanking them for helping to keep our communities and their customers safe. And just like Mom says, good behavior should be rewarded. Let's thank these companies. Go to the link below and sign their open letter here. The ENOUGH Campaign is truly inspired by this teen and hopes that others follow her lead. "Anyone can read statistics or reports. What makes this a REAL issue is students' voices, and adults' voices, and moms, dads, and faith leaders who have had to go to hundreds & hundreds of funerals for their congregation members in just the span of a year, because of gun violence. These are the voices we have been projecting for the past year. THESE are the voices that are really going to change the movement." "If we really want to understand, predict, and prevent gun violence in the United States, this is the breadth of analysis that is necessary, says a panel of experts called upon by the American Psychological Association. "Their report, issued Thursday, is not without recommendations -- some that will be controversial, others that are indisputable. "The panelists say that "the practice of keeping all firearms appropriately stored and locked must become the only socially acceptable norm" -- fighting words to those who believe their safety depends on having their guns always at the ready. Universal background checks, an initiative rebuffed again this year by gun rights advocates, can reduce the diversion of guns to criminals, they note. And they venture into politically sensitive territory in noting that prohibitions on firearm ownership among high risk groups -- including domestic violence offenders, those who have been convicted of violent misdemeanor crimes, and those with mentally illness who have been found legally to be a threat to themselves or others -- have been shown to reduce violent crime." It's time for some holiday giving! DONATE to support gun violence prevention initiatives. The ENOUGH Campaign's purpose is to motivate people in great numbers to challenge the current gun laws and to keep the common sense gun law conversation alive. In a nutshell, we aim to Inform. Organize. Inspire. Act. One of the many ways we do this is by making recommendations to the public, companies, and small businesses to direct their end-of-year contributions to specific gun violence prevention organizations that we feel excel in policy, program, and function. When making your donation, find out if your employer has a matching donation program to double your support. Americans for Responsible Solutions is the nation's answer to the rich and persuasive gun lobby: with ARS and likeminded friends engaging millions of people about ways to reduce gun violence and supporting lawmakers willing to take a stand for responsible policies, legislators will no longer have reason to fear the gun lobby and their dangerously deep pockets. The Brady Campaign works to pass, enforce, and protect sensible laws and public policy that address gun violence at the federal and state level. Having a rich history since 1974, Brady engages and activates the American public, electing officials who support common sense gun laws, and increasing public awareness of gun violence. The mission of Connecticut Against Gun Violence is to identify, develop, and promote passage of legislation designed to enhance gun safety. CAGV will pursue this mission at the local, state of Connecticut, and national levels through the political process. Law Center to Prevent Gun Violence is the only national law center focused on providing comprehensive legal expertise in support of gun violence prevention and the promotion of smart gun laws that save lives. As a non-profit organization founded by attorneys, they are dedicated to preventing the loss of lives caused by gun violence by providing trusted, in-depth legal expertise and information on America's gun laws. Mayors Against Illegal Guns is a national, bipartisan coalition of mayors working to make America's communities safer by keeping illegal guns out of dangerous hands. MAIG recently joined forces with Moms Demand Action for Gunsense in America, which adds to their strength in organizing even larger numbers of people across the US. Newtown Action Alliance is a grassroots organization dedicated to reversing the escalating gun violence epidemic through the introduction of smarter, safer gun laws and cultural change. The ENOUGH Campaign is a proud member of the NAA. Led by community members and several parents and spouses who lost loved ones in the tragic mass shooting at Sandy Hook Elementary School on December 14, 2012 that claimed the lives of 20 first-graders and 6 educators, Sandy Hook Promise raises awareness, educates and engages individuals and communities on how to prevent gun violence - specifically in the areas of mental wellness, community connectedness and gun safety. Please also consider making a memorial donation to those that died in the Newtown massacre. This link will take you to a detailed list of each child and adult's memorial funds. This is not a postcard from vacation. Wish You Were Here (to support universal background checks)! In the two weeks leading up to the one year anniversary of the Newtown massacre, the Greenwich Council Against Gun Violence held a powerful letter-writing campaign where hundreds turned out to send loud and clear messages to our representatives that we want stronger, safer gun laws in our country. Rep Michael Grimm (R-NY) says he wants to see comprehensive mental health and criminal background checks prior to gun ownership, calling them "smart and prudent," and has called for "closing the loopholes" on gun ownership laws. A major drug and gun-trafficking ring led to the arrests of 39 suspects in his Staten Island district last August, so his district is not immune to our country's gun violence problem. Our 7th grade friend has a simple question, Mr. Grimm, "can you keep my fellow students safe?" The answer is "yes": you can co-sponsor Thompson-King universal background check legislation, and tell your Republican leadership to bring it to the floor for a vote. Thank you to the Greenwich Council Against Gun Violence and all those who participated in the event. Keep writing your representatives!